The Chinese philosopher and political theorist Confucius was dedicated to the ideal of humanity and to social reform. The Chinese philosopher and political theorist Confucius was dedicated to the ideal of humanity and to social reform. He advocated the avoidance of unnecessary conflicts and wars, a liberal form of government based on the experience and virtue of its ministers and a reduction in taxation. His philosophy, which was known as Confucianism, was the official Chinese ideology for centuries prior to the 1949 revolution. The Chinese philosopher and teacher Confucius was born in 551 BC in the state of Lu, now Shantung province. 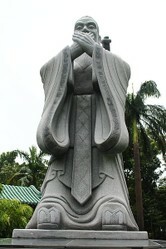 His family name was Kung, and Confucius is the Latinized version of Kung Fu-tzu (Kung meaning 'the master'). Orphaned at an early age, he lived in poverty and was self-educated. Although Confucius was regarded as one of China's greatest scholars, his main ambition was to reform the Chinese social and political system in order to improve conditions for the poor. His teaching became the instrument of reform and in time many of his students attained positions of authority where they could apply some of his principles. Like the ancient Greek philosophers, he discussed ideas with small groups of students, encouraging them to develop their own ideas and solve their own problems. Because he believed it was a basic right of all people to make their own decisions, Confucius questioned the basis of Chinese authoritarian government. By accepting intelligent and enthusiastic students from poor families as well as rich ones, later placing them in government jobs, he was able to break the monopolistic control of the government by the aristocracy. When in his 50s, Confucius accepted an administrative post in the state of Lu, which enabled him to introduce many reforms and put a fair judicial system into operation. Unfortunately, the ruler of a neighboring state became resentful of the power that Lu obtained through Confucius' abilities and managed to arrange for his dismissal. Confucius spent most of the years 496-484 BC in a fruitless search for another ruler who would allow him to put his reforms into practice. Discouraged, he retired and spent the remaining years of his life recording his views and comments on the classics. The influence of Confucius on Chinese society was greater after his death than during his lifetime. The philosophy of Confucianism, while not a religion in itself, teaches acceptance of many aspects of Chinese religion, such as reverence towards heaven and ancestor worship. The key concept of the Confucian philosophy is jen, translatable as love for one's fellow man, which was the basis of his principles of political reform. The Confucian philosophy and code of ethics has had profound effects on Chinese politics and government, family and society, and art and literature. His emphasis on the importance of all people encouraged respectful affection towards older members of the family and also social courtesy, elements that continue to be a vital part of Chinese culture. Although Confucius considered the arts to be important, his attitude was restrictive, as he wished the various art forms to portray only the principles of his own philosophy at the expense of the unacceptable features of human personality and society. This has resulted in much of Chinese literature and art being rather conservative and moralistic in tone.